Precise-Point-Positioning (PPP) for satellite navigation systems is an attractive localization method because it does not require any raw measurements from a reference station and it offers a high accuracy in the determination of the position. However, it requires satellite position and clock corrections, atmospheric corrections and satellite phase and code biases with a total error of at most few centimeters. 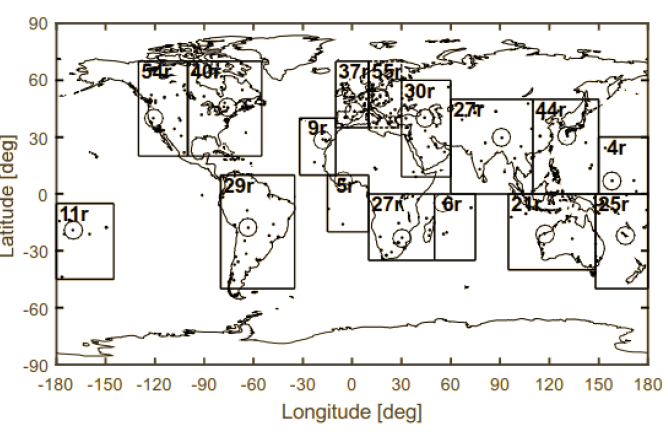 Mapping of the ambiguities of the reference satellite to the receiver phase biases. Second, a multi-cluster solution is performed, in which the state vector estimates for the clusters are combined by an optimized least-square adjustment. A parameter mapping is used, which exploits the integer property of ambiguities both within each cluster and between different clusters and, thereby, enables a faster convergence of the satellite corrections. A user can freely choose the type of processing for determining its position, either by combining measurements or by forming differences of measurements with measurements of a reference base station. The application of the method is not limited to dual frequency measurements, but supports also GPS, Galileo, Glonass and Beidou with three or more frequencies. Figure: Map of IGS stations with 16 clusters. The number of receivers per cluster is provided in the upper left cornerof each cluster. The reference receiver of each cluster is additionally highlighted.